Rabbi Benjamin Weiner, writer, scholar of Yiddish and Irish literature, musician and homesteader, became spiritual leader of the Jewish Community of Amherst in 2010. 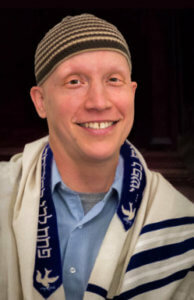 Prior to his arrival in Amherst, he served as part-time rabbi and education director at Mishkan Ha’am, a Reconstructionist community in Hastings-on-Hudson, N.Y. Growing up in Newton, Massachusetts, in the Conservative Jewish tradition, Rabbi Weiner graduated from the Reconstructionist Rabbinical College in 2008. Previously, he studied English Literature at Columbia University and received a Masters of Philosophy degree in Anglo-Irish literature from Trinity College in Dublin, Ireland, focusing his thesis on the works of James Joyce and Samuel Beckett. Rabbi Weiner’s study of Yiddish as an undergraduate led him to participate in summer programs in New York, Vilnius, and Paris, and he now speaks and reads the language fluently. Often reporting on arts, culture, politics, and religion, his essays have appeared in a variety of publications, including Pakn Treger, the magazine of the Yiddish Book Center. His interest in the rabbinate developed through work as a b’nai mitzvah tutor. While in rabbinical school, he served as chaplain for adults with mental illness, Jewish elders, and terminally ill hospital patients. In addition, he interned in the RRC archives, analyzing the Hebrew and Yiddish letters of Mordechai Kaplan (founder of Reconstructionist Judaism) and, under a Luce Foundation grant, at the Institute for Christian-Jewish Study in Baltimore. Rabbi Weiner is committed to creating a vibrant and multi-faceted environment at the JCA, recognizing that people seek out Jewish community for many reasons, ranging across the religious-secular divide. He is particularly inspired by Kaplan’s vision of the modern synagogue as the meeting ground of the contemporary Jewish experience, where past and present are brought into productive dialogue. He believes religious community has an important role to play in providing solace and inspiration for those seeking to navigate our increasingly “interesting” times. Rabbi Weiner sings and plays piano, banjo and guitar. He and his wife, Cantor Elise Barber, a graduate of the Cantor/Jewish Studies program at Boston Hebrew College, live on their three-acre homestead in Deerfield, along with their son Efraim (Frank) Dean Weinbarber, several goats and chickens, and a hive of bees.